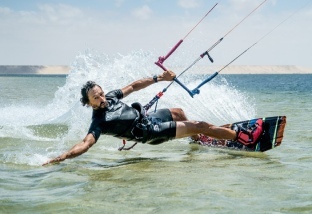 Kitesurfing Tarifa: With our private lessons you learn kitesurfing in the fastest and most effective way adapted to your needs. Let us advise you! 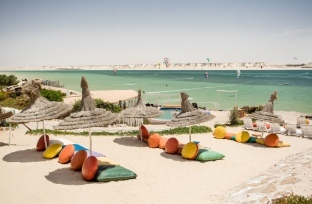 Combine action & relaxation with our kitesurf & yoga course! Also personalized offers available! A great opportunity to taste the real surf and kitesurf lifestyle, carefree, adventurous, and breathtaking. Unlimited hours of kitesurfing and surfing. A unique and truly rich experience. Are you still looking for a fancy venue for your corporate event, incentive or private party? How about Tarifa? We are happy to help you with the organization and realization of your event. 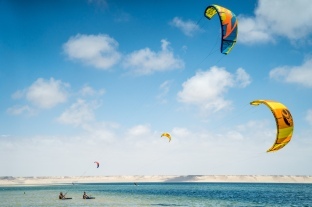 “Awesome people, great vibe, professional Kitesurf instructors I loved my stay at Free your Mind and will be defo back! I was here for a week and I had a blast with the free your mind team! Their structured approach to teaching and the way they care about the students really left an impression with me! If you're trying to find a kite school in Tarifa then look no further! Without hesitation I would recommend free your mind! I learned to kite in Tarifa in May 2015. First impression : Lovely equipped surf shop ( almost everything dIY ) and incredibly friendly staff who respond to the individual needs and level. They have great kite equipment and drove to various surf spots depending on the wind strength . With the Zian kites we were all very satisfied . The lessons were very concerned about safety and optimal conditions . So overall everything tiptop - I love FYM ! Your watersports and event partner in Spain, Morocco and Sri Lanka ! Why you should choose Free your Mind ? We only believe in excellent customer service. We genuinely care for all our guests and commit to their total satisfaction. Insights and expertise in the kite & surf industry: from knowing the world class spots to the kites production and manufacturing. Our key priority is make tourism more sustainable: having a positive impact on the environment, society and economy. Our policy of No Wind, No Pay, guarantees your money back in case classes or courses can not be done. We have the perfect place just for you! Pick a destination and let us take care of the rest. +34 - 669 26 16 78. We will get in touch with you as fast as possible! Enter your number in the contact form and we call you back !